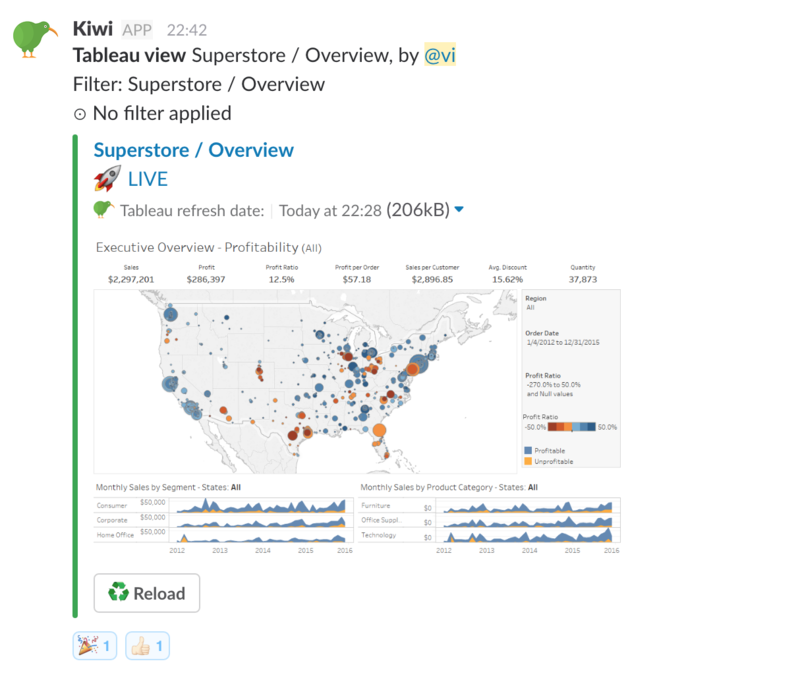 Once you have connected Slack successfully to Kiwi, users will be able to request Tableau views and dashboards in any Slack channel. 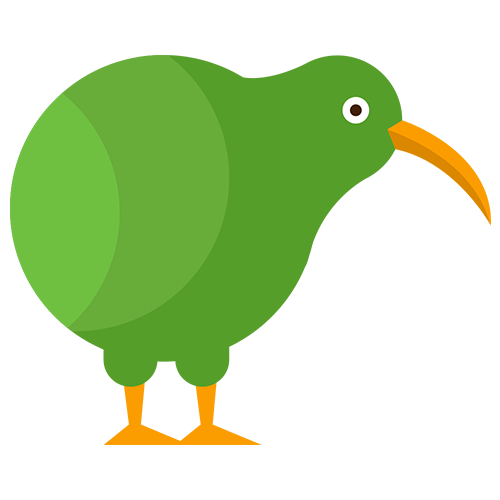 Start the Kiwi app with the Slack action menu and select Start (Kiwi). 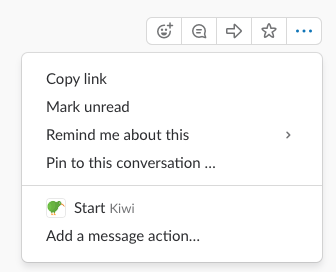 If you cannot see it select "More message actions..." or alternatively type "/kiwi" in any Slack channel or conversation and press enter to activate the Kiwi app menu in Slack. 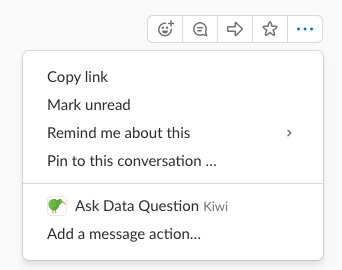 Start the Kiwi app with the Slack action menu and select Ask Data Question (Kiwi). If you cannot see it select "More message actions..."
Just click on the dropdown field to see all reports that you have got access to. 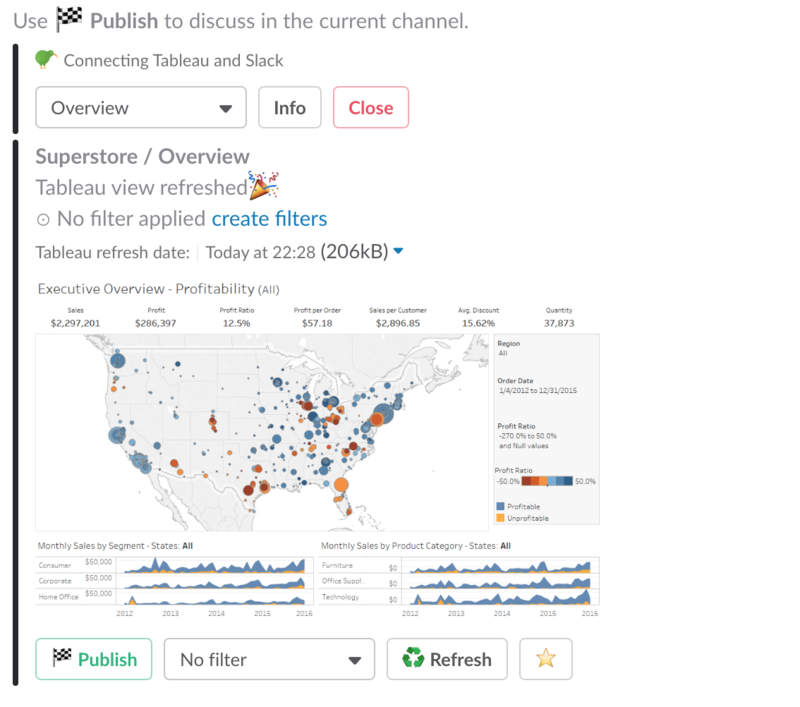 Your Tableau Views are grouped by favorites and workbooks. You can even search for Views. Select the Tableau View that you would like to share from the list, by clicking on a list entry. A preview of the corresponding View will be loaded and displayed only to you. You can then apply Filters to the View (if available), select another View, set the selected view as favorite or refresh the View, before submitting it. Click "Publish" to post the view to the current channel or conversation. The view will be posted shortly after and will be visible to all members of the channel or conversation. In Slack you can add reactions to a post to show what you think of it. Just hover over the published report and you will see a popup displayed in the upper right hand corner. Click on the "Add reactions..." button, to add reactions. To keep track of conversations around a certain report, you can start a seperate thread. Just hover over the published report and you will see a popup displayed in the upper right hand corner. Click on the "Start a thread" button, to start a thread. 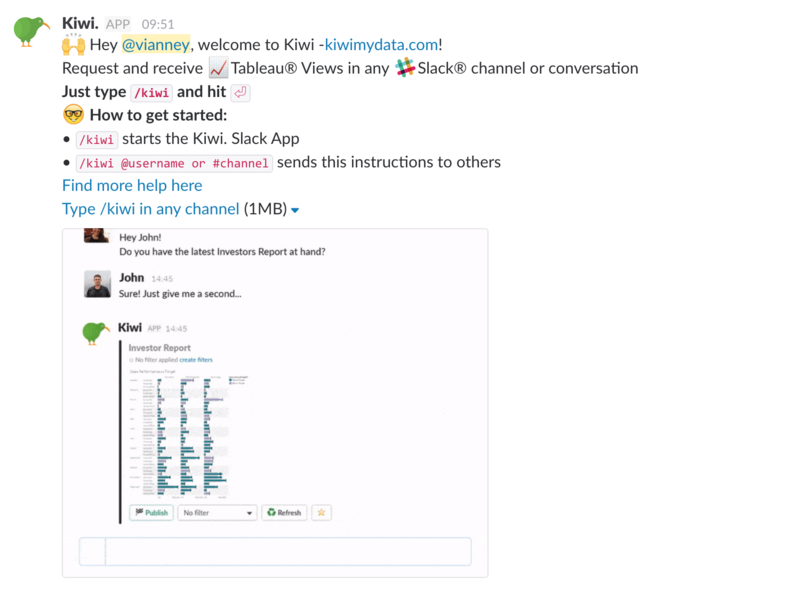 We made it very simple to let your Slack team know about Kiwi. 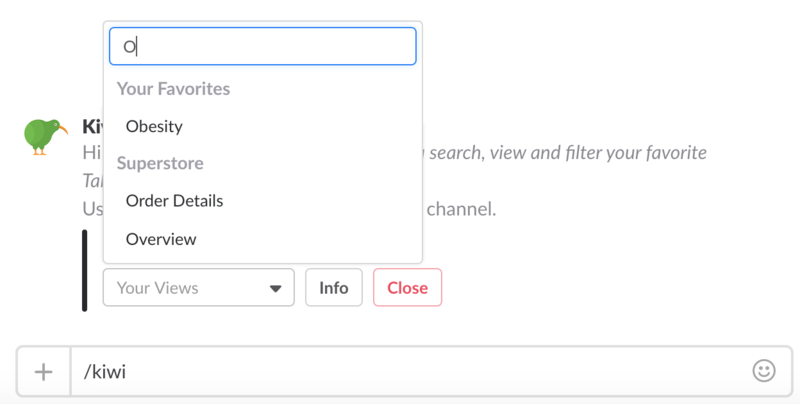 You can also invite multiple users or channels with one command. Make sure they have permission to view your Tableau contents though.